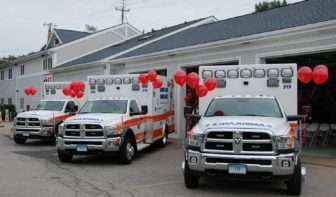 Three new ambulances have been added to Darien EMS-Post 53’s fleet thanks to the generosity of the McGraw and Ziegler families of Darien and the Friends of Post. The ambulances, featuring the latest in safety and technology, were launched at a ceremony on Sept. 23. “Over the years the Ziegler and McGraw families have been most generous in their support of the mission of Post 53 to not only provide the highest quality of emergency care to the Town of Darien, but also to offer young adults the opportunity to grow and gain experience in the medical field while serving their neighbors and their community.” said Jay Wood, chairman of the board. The process of turning donations into ambulances was the job of nine-year Post veteran Marc McEwan, with the help of other Post 53 adult advisors. McEwan served as point person, setting ambulance specifications, placing the order, organizing radio installations and getting final inspections and registrations completed. This process was repeated for each ambulance over a three month period to avoid interrupting Post 53’s 24/7 service as older ambulances were phased out. “In constant use and responding to over 1,600 calls each year, it is essential that our equipment is ready to serve on a 24/7/ 365 basis.” Wood said. Founded in 1970, Post 53 provides emergency medical services to the Darien community using Darien High School students, adult volunteers and paramedics. “I am so proud to stand before these ambulances today, knowing they’ll be used by some of the most amazing and qualified people I will ever meet,” said Siddhant Parwal, president of Post. Darien EMS-Post 53 announced that Joe Larcheveque has been named executive director, effective Oct. 1, replacing Nancy Herling. Larcheveque is the ninth person to serve as director in the 48-year history of Post 53 and the first paid executive director of the volunteer ambulance service.